Members can sign up once per day to try and win a dvd of an AC/DC concert. These shows are chosen at random by BigNate, and the winner receives a dvd of the show listed. The DVD Give-Away runs once monthly and members can enter one time per day from the 1st of the month until the 21st. You may enter as many times as you like, but are limited to 1 entry per day. In August, you have a chance to win a copy of the multi-cam mix from the June 21, 2009 show in Goteborg, Sweden! This is a fan produced dvd featuring around 6 angles mixed together into one dvd, and comes in really nice packaging with a commemorative sticker that looks like a photo badge. This is a really great item if you enjoy watching live shows, and the artwork & case are great as well! If you don't want to wait to get a hold of a copy, you can also purchase one here. You can enter one time per day so be sure to visit daily! Good luck! 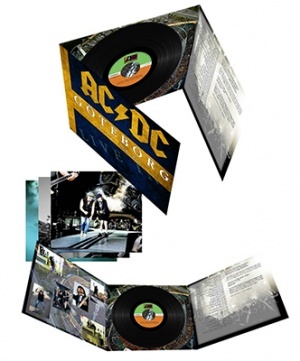 This Give-Away is eligible only for members of acdc-bootlegs.com and acdc-videos.com. Each member is allowed to sign up one time per day between August 3rd, 2015 and August 21st, 2015. If you are caught siging up using multiple accounts or cheating in any other way, you will be banned from the site. Each entry must contain your full mailing address to be considered valid. You may enter your mailing address into the 'Update User Info' tool on the Member Options page to pre-populate this area so you don't have to fill it out time after time. Any mailing address submitted to this site, either through the member options or through this form, will not be shared, sold or given away in any way. This information is considered confidential and is not publicly viewable by any member, except for the admin of this site. The winner will be chosen at random after the Give-Away has closed. The winner will then be contacted via Private Message on this website notifying them that they won, and the dvd will be sent out a few days after that. There is no longer a need to reply to claim your prize. If the entry that was chosen is not valid, a new winner will then be selected randomly again. This process continues until a valid entry is chosen. Angus67 entered the give-away 2 times. There were 209 total entries.